— Thad Roberts, who was sentenced in 2003 to eight years in prison for his role in the theft of moon rocks from NASA, won a 10 month reduction in his sentence on Friday, reports Henry Pierson Curtis for the Orlando Sentinel. "An appeals court ruled [District Judge Anne C.] Conway had erred [in 2003] by giving [Roberts] more time than... guidelines permitted without adequately determining whether his crime greatly disrupted NASA operations," writes Curtis. "Friday's hearing determined that the theft destroyed the value of the rocks as research specimens, because the theft broke a chain of custody that began the moment astronauts picked the rocks off the surface of the moon in 1969," the Sentinel reports. "The hearing set the cost of the theft to NASA, taxpayers and [Everett K.] Gibson at about $7 million in lost research and productivity." Curtis notes that while being held in a minimum-security prison in Colorado, Roberts began an astronomy club and hoped to complete his doctorate and "try to find a way to make a positive contribution to the scientific community." During yesterday's hearing, Roberts apologized from the stand to Gibson, whose lab he and his three friends broke into to steal the moon rocks and whose research journals had been lost in the heist. Conway, in closing, stated she believed Roberts knew of the location of Gibson's records despite Roberts' testimony to the contrary. — "Sheer Lunacy", by Michael Goldstein, special to the Los Angeles Times, provides a new look at the two-year old heist of a safe-full of moon rocks and meteorites from Johnson Space Center. Goldstein spoke with Thad Roberts and Gordon McWhorter, who are both serving multi-year prison sentences, their families, and their colleagues to arrive at a more complete timeline of the theft then previously published. Whether it was for love or money, or just the thrill of it all, Roberts' audacious scheme was sheer lunacy — and it worked. The safe yielded a uniquely American treasure: 101 grams of lunar samples collected on the six Apollo moon landings, with the curatorial forms that confirmed their authenticity. The safe also contained a Martian meteorite that hinted at life on the red planet. They had hit the jackpot. But with moon rocks on their minds, and dollar signs in their eyes, they didn't see the obvious craters on the landscape. 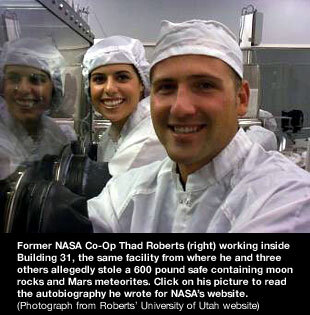 — Former NASA co-op student Thad Roberts, the so-called "ringleader" of the July 2002 heist of a safe full of moon rocks from Johnson Space Center was sentenced today to eight years and four months in a federal prison, reports the Associated Press. In addition to jail time, Roberts will serve three years probation and perform 150 hours of community service. Gordon McWhorter's mother upheld his innocence, saying he would never knowingly take part in a crime and that Thad Roberts must have duped him into participating. Roberts still awaits sentencing on October 29. Prosecutors and defense attorneys agreed to value the stolen lunar and Martian material at between $2.5 million and $7 million. The court determined that it cost $50,800 per gram to collect the lunar samples (in 1962-1973 dollars). The stolen sample of ALH84001 was valued at $1.8 million based on the market value of similar Martian meteorites. Also today, the court sentenced Tiffany Fowler and Shae Saur to three years probation. Fowler and Saur will each serve the first 180 days of their sentence in home detention and will be required to complete 150 hours of community service. Each also must pay $9,167 restitution to NASA for items lost or stolen during the theft. Gordon McWhorter will be sentenced in late August. Thad Roberts' sentencing will be combined with another case in September, for his theft of dinosaur fossils. A hearing planned by the U.S. Attorny's Office to establish the market value of the moon rocks was foregone when defense counsel agreed to a value of $5 million or more. The $50,800 per gram in 1973 dollars set by the court is equivalent to $206,000 today, based on on data from the Federal Reserve Bank. Both Saur and Fowler were astronaut hopefuls. With felony convictions, both are now ineligible. The court must determine the value of the stolen goods: in this case, Apollo-recovered moon rocks and samples of ALH 84001 "Martian life" meteorite. This is the first time lunar rocks will be appraised. While the moon rocks may be price-less (for now), the value of the Martian rock has been established as at least $1.4 million. The roles of the four defendants is now clearer: Roberts, the ring leader, and his mistress (Roberts' was married) Fowler, joined by fellow NASA intern Saur, stole the safe. McWhorter, Roberts' friend, served as the broker. Roberts and Fowler caught up with McWhorter in Orlando, where the trio sought to sell the rocks to Belgian collectors (undercover FBI agents). The heist had lifted a total of 101.5 grams of lunar material, which McWhorter tried to sell for $2,000 per gram. By comparison, Sotheby's sold less than a gram of lunar material returned by a Soviet probe for $442,500 in 1993. Roberts, Fowler, and Saur will be sentenced Aug. 5, the same day as the evidentiary hearing for the market value for moon rocks, needed to sentence McWhorter on August 27. — Gordon McWhorter was convicted in federal court today for his role in the theft of moon rocks, on charges he stole property of value to the United States and interstate transportation of stolen property. McWhorter, who was the only one of the four defendants not to plead guilty, will be sentenced on Aug. 27. He faces up to 25 years in prison and $250,000 in fines. McWhorter's attorney says he plans to file an appeal. — Thad Roberts, the alleged ring leader responsible for organizing the theft of moon rocks and Martian meteorites from Johnson Space Center, took the stand yesterday to testify against his partner in crime and friend, Gordon McWhorter. "I took my girlfriend and a friend on July 13," Roberts testified before an Orlando federal court. "And came out with the whole five-drawer cabinet and the whole safe." E-mails between McWhorter and Roberts were used by Asst. U.S. Attorney Rachelle DesVaux Bedke to establish "that the pair had planned to find buyers for the moon items months ahead," according to the Orlando Sentinel. Also testifying Tuesday was FBI Agent Lynn Billings, who went undercover to meet with McWhorter, Roberts and his girlfriend Tiffany Fowler. "I'm just hoping you don't have a wire on you," joked Roberts upon meeting Billings, and as was played back from recordings for the court. Although Roberts has pled guilty, he's been held without bail for the past 319 days. He has used the time to write a novel based on his experiences. "It's based on truth, but it's embellished," said Roberts to a prosecutor. He plans to make it available online for prospective publishers. The trial against McWhorter ends today. — The trial of four students alleged to have stolen a safe full of moon rocks, Martian meteorites and 33 years of NASA research from Johnson Space Center began yesterday in an Orlando, Florida federal court, reports the Orlando Sentinel. Gordon McWhorter, the only one of the four not working as a student intern at NASA at the time of the theft, is also the only defendent not to have plead guilty. His friend and alleged ring leader Thad Roberts, along with Shae Saur and Tiffany Fowler, are expected to testify as witnesses for the prosecution. While the theft of the lunar and martian samples made headlines last summer, the missing clothbound journals, the work of NASA Senior Scientist Everett K. Gibson Jr. on the origins of the universe, were unknown publicly until the trial. "We, as scientists, are responsible for every gram of samples allocated to us," said Gibson as part of his testimony delivered by recorded video. "Every grain must be returned because they are the property of the people of this nation." In her testimony Monday, Fowler said that McWhorter didn't know about the stolen moon rocks until he met up with Roberts and her at the Orlando hotel where they were arrested. "He was surprised and seemed somewhat impressed," said Fowler, who was Roberts' girlfriend. Roberts, who has been held without bail for several months, has spent his time preparing a manuscript about the theft. According to the Orlando Sentinel, he told the prosecutor "he wanted it to be like a movie that he could interest people in at some later date." — Gordon McWhorter confirmed in a Utah court hearing today that he is... Gordon McWhorter. Apprehended for failing to appear in a federal court for the theft of moon rocks, McWhorter intially told authorities he was Job from the bible. McWhorter will be transported to Florida for the trial, to begin no sooner than next month. — According to the AP, alleged moon rock thief Gordon McWhorter was apprehended in Provo, UT, after failing to appear in court a day earlier. Arrested April 8, McWhorter was taken to Salt Lake City for an identity hearing but failed to cooperate. A second hearing has been scheduled for April 15. McWhorter's co-defendant Thad Roberts was charged on Wednesday with stealing dinosaur fossils and footprints from an unspecified site in Utah. The new case will be folded into the moon rock trial when it resumes in May. — Gordon McWhorter failed to appear in an Orlando federal court yesterday, according to the Orlando Sentinel. He was the only defendant of the four alleged moon rock thieves to not plead guilty. With a bench warrant issued for his arrest, the earliest the court could reconvene for McWhorter's trial would be sometime in May. The other defendants — Thad Roberts, Tiffany Fowler and Shae Saur — plan to testify against McWhorter, court records show. McWhorter "had been staying with his mother in North Carolina." She did not return a telephone message from the Orlando Sentinel. "On December 17, 2002, Tiffany B. Fowler and Shae L. Saur appeared before a United States Magistrate Judge, Middle District of Florida, and pled guilty to charges of conspiracy to commit theft and interstate transportation of stolen property. On December 18, 2002, Thad R. Roberts pled guilty to the same charges. "Fowler, Saur and Roberts, students working at NASA's Johnson Space Center, conspired to steal a 600-pound safe that contained priceless lunar samples and Martian meteorites. A fourth individual, Gordon S. McWhorter, was also charged with conspiracy to commit theft and interstate transportation of stolen property. McWhorter is scheduled to go to trial in January 2003." — One of the four students charged with stealing lunar samples from NASA's Johnson Space Center in Texas, has pled guilty and is cooperating with prosecuters, according to the St. Petersburg Times. Tiffany B. Fowler pled guilty to theft conspiracy and illegal transportation of moon rocks. Her accomplices, Thad Roberts, Gordon McWhorter, and Shae Saur pled not guilty and remain free on bail. Roberts and McWhorter were indicted for theft conspiracy, illegal interstate transportation and possession of stolen lunar samples. Saur is charged with conspiracy. With a lack of family support and stable addresses, U.S. Magistrate Thomas McCoun III ordered that Roberts and McWhorter be held until "reputable" adults could post bail. Roberts' wife is on the verge of filing for divorce and his "very strict" Mormon family won't talk to him, according to his attorney John Fernandez. He will now look towards friends for help. In addition to an aggravated assault charge, Gordon McWhorter has a burglary conviction and "tested positive for marijuana use after the moon rock arrest." Although he called his Mormon family "strange," McWhorter will appeal to his mother for assistance. Roberts (posing as the fictitious "Orb Robinson") posted news of his offer to the website on May 9. He also e-mailed club members directly, including Emmermann with a similar message. "I couldn't bring myself to buy anything," admitted Emmermann. "It's wrong, and no one should make money out of those rocks. I find it appalling and immoral." Emmermann contacted the FBI on May 24. With coaching from investigators, he coaxed "Orb" to meet with undercover agents posing as his brother and sister-in-law in Orlando. Emmermann's actions in this case were a means of repaying the U.S. for the 1978 loan of a moon rock for an exhibit. "We have paid our debt to NASA in full by stopping this conspiracy." Despite the advice of his court-appointed attorney, McWhorter insisted on making a statement during Wednesday's hearing. "When told he could face more than five years in prison, McWhorter became animated. 'They are trying to crucify me,' he said, according to observers." The two could be released on $25,000 bail today. Thad Roberts aspired to be an astronaut. Enrolled in a triple degree program in physics, geology and geophysics at the University of Utah, he was also a licensed pilot and scuba diver. According to relatives, Gordon McWhorter was known to "dream up get-rich-quick schemes." He and Roberts appeared "to have been conspiring at least as early as April." McWhorter, who also faces an aggravated assault charge in Utah, shared his moon rock scheme with his uncle during the first week of April. "I have access to moon rocks, and I am going to sell them for $1 million." Roberts had an affair with Tiffany Fowler. "Roberts and his wife separated when she learned of the relationship." According to authorities, Roberts, Fowler and Saur broke into the NASA lab and used a dolly to wheel the 600 pound safe to a loading dock and into a Jeep Cherokee. "The 600-pound safe was broken into at a Clear Lake motel and later discarded." "Roberts, Fowler, Saur and McWhorter face up to five years in prison and or fines of up to $250,000, said Steve Cole, a spokesman for the Attorney's Office in Tampa." Apollo 17 moonwalker Eugene Cernan expressed bewilderment at the actions of the four students. "I just don't understand where they were coming from and how they thought they were going to get away with selling moon rocks. It doesn't take a lot of courage. It takes a lot of stupidity to do what they did, quite frankly." Saur was also quoted in the Roundup, in connection to singer Moby's recent appearance at the space center. — Axel Emmermann of the Mineralogy Club of Antwerp, Belgium, contacted collectSPACE today via e-mail. It was his club's website that Roberts used to post the moon sale offer and it was Emmermann who, in cooperation with the FBI, posed as the interested buyer in e-mail exchanges. Emmermann's actions lead to the FBI's quick and smooth recovery of the stolen samples. At the time of the heist, Roberts was employed by JSC's Mission Operations Directorate assigned to the Neutral Buoyancy Laboratory. Fowler was hired by the Space and Life Sciences Directorate while Saur worked for the Structural Engineering and Thermal Design division. McWhorter was identified as a friend of Roberts' from the University of Utah. Roberts, as "Orb Robinson," became nervous as the deal to purchase the samples proceeded. He raised his asking price to $2000 to $8000 per gram prior to meeting the U.S. relatives (FBI undercover agents) of a Belgian rock hound. Roberts, McWhorter and Fowler were arrested in Orlando after driving from Houston to complete the sale. Saur stayed behind to "complete a scuba diving certification." Saur and Fowler posted bail while McWhorter and Roberts were being held at a Florida jail. Though the theft of the safe took place on July 13, it took two days for NASA personnel to notice. Roberts wrote an e-mail to undercover agents that his "connection responsible for handling acquisition of the samples had bought the combinations to the building, room and safe" but upon encountering the 600-pound vault, "discovered that the combination was invalid. He then had no choice but to remove the entire safe — an exceedingly more complex task." "The FBI will safeguard the lunar and meteorite samples as evidence and will not return them to Houston's space center until a trial is concluded." — The FBI and NASA's Office of Inspector General (OIG) announced today the successful recovery of lunar samples stolen by student employees working at NASA's Johnson Space Center (JSC) in Houston, Texas. Agent James Jarboe with the FBI's Tampa division and Lance Carrington, NASA OIG Assistant Inspector General for Investigations, announced the arrests of Thad Ryan Roberts, age 25, Tiffany Brooke Fowler, 22, Gordon Sean McWhorter, 26, and Shae Lynn Saur, 19, for the theft of lunar samples returned from each of the Apollo missions. On July 13, the four students allegedly stole a 600-pound safe housing the rocks — as well as a fragment of the ALH 84001 "Martian life" meteorite — from Building 31, NASA's main repository for Apollo lunar samples. In an interview with MSNBC.com, NASA spokesman Kyle Herring said the safe included "53 different lunar samples, amounting to five ounces (142 grams); and 165 meteorite samples, also amounting to five ounces. 'None of the samples [were] pristine,' he said; rather, all of them had been 'degraded by previous analysis.'" Roberts, McWhorter and Fowler and were apprehended on Saturday in Orlando, Florida, and charged with conspiracy to commit theft of government property and transportation in interstate commerce of stolen property. Saur was taken into custody in Houston and also charged with conspiracy. Student co-ops at the space center, Roberts, Fowler, and Saur were dismissed from their respective employment programs as a result of their involvement in the case. Jarboe said that since May, an undercover operation had used e-mail to communicate with an individual (identified later as Roberts) who was selling priceless moon rocks described as "the world's largest private and verifiable Apollo rock collection." The Associated Press reports that Roberts initially posted the offer to the website of the Mineralogy Club of Antwerp, Belgium. With sale prices of $1,000 to $5,000 per gram, Roberts appeared to be familiar with the laws governing the sale of astromaterials. "As you well know, it is illegal to sell Apollo lunar rocks in the United States," wrote Roberts in an e-mail quoted by the AP. "This obviously has not discouraged me since I live in the United States. However, I must be cautious that this deal is handled with delicacy in that I am not publicly exposed." The e-mail messages were sent from several locations — the University of Utah, the Johnson Space Center, and a public library in Houston. The exchanges included curatorial and historical records on the samples provided by the seller, and culminated in a meeting at a restaurant in Orlando over the weekend of July 20, to finalize the purchase. The defendants arrested in Orlando appeared before U.S. Magistrate Judge Thomas B. McCoun on July 22. Citing Jarboe, the Associated Press reported "that with the current charges the suspects each face up to five years in prison, but more charges are likely." The FBI began investigating after receiving a tip through an e-mail address established by the Tampa Division for Internet Fraud Matters.